1045 CARBON STEEL. 72" Wide x 90" Length ( ONE 6' WIDE x 7-1/2' LONG SECTION ). 1/2"x 3-1/2" long tines. Heavy Duty Universal Drawbar. Power Required To Pull = 12HP. TOTAL WEIGHT 171. It is easy to use and handle. Perfect Results. No Lubrication or Adjustments required. The Chain harrow is ideal for the horse and cattle farmers that are spreading manure to help control parasites, for preparing seed beds, covering seed beds to enhance germination, harrowing in fertilizer on hay fields to assure a faster, more vigorous re-growth, incorporating herbicides, root raking, pasture renovation, land leveling and landscaping. If you have any questions about this product by Neat Attachments, contact us by completing and submitting the form below. If you are looking for a specif part number, please include it with your message. 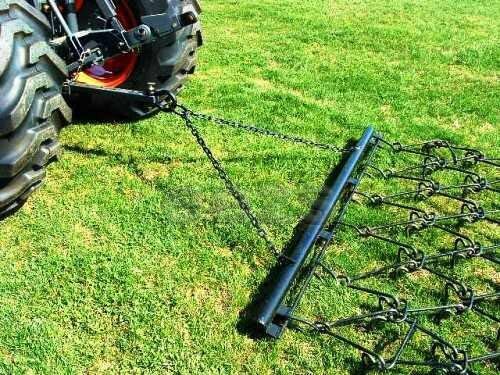 Chain Harrow - 8' x 6' Variable Action Drag Chain Harrow.